Prior to Advantage Credit, Olga worked in the Banking industry for over 16 years where her roles included foreign services, customer service and wire transfers. 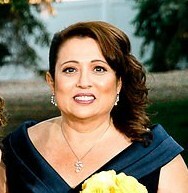 Born and raised in Argentina, she has also lived in California and Oklahoma but has called Colorado home for 33 years. In her free time, she enjoys cooking, watching movies. She also really loves spending time with her husband David, two daughters, four grandchildren, and soon to be fifth grandbaby. Since Spanish is her first language, she loves to use it whenever possible.